As many of you know, we adopted two of the most beautiful and precious children on the Earth in August of 2012. It was a dream come true after several years of yearning for children. It was such a blessing to us that we decided to adopt once more from Ethiopia starting in May, 2016. This last week (December 1, 2017), we received some amazing news from our agency. They have a baby boy waiting for us!!! His name is Abenezer and he is a little over 1 1/2 years old. At this point he is malnourished and very underweight, but otherwise seems to be developing well. He has been transferred to the transition home in Addis Ababa, Ethiopia, where he will remain until he can join our forever family. In telling you this incredible news, we must also be honest that we really need your prayers and financial support. While we have already invested almost $10,000 ($15,000 as of 3/1/2018) for the first phase of the process, the next phase is a little more than we remember from the last time through. We need over $20,000 $13,000 more (as of 3/1/2018) to cover more agency fees, increased international fees (humanitarian aid, orphanage care workers, etc.) visas, medical care, travel to Ethiopia and the list goes on. We do not know exactly when we will be able to bring him home but we have been told to estimate between 6-8 months from now. In I Samuel 7:10, it describes a situation where Samuel was sacrificing a burnt offering on behalf of Israel, and during this time the Philistines drew near to engage in battle. The Israelites went out and God sent them supernatural help. “That day the LORD thundered with loud thunder agains the Philistines and threw them into such a paic that they were routed before the Israelites.” And then Israel’s victory was decisive. To celebrate and commemorate the divine victory, “Samuel took a stone and set it up between Mizpah and Shen. He named it Ebenezer saying, “Thus far the LORD has helped us.” vs 12. And so, we too, believe that with God’s supernatural help, this will be our Abenezer. May this be a point in our lives that we place a stone to always remember that his strength allowed us to do the impossible and may we feel and hear his thunder in such a way that is divine. For we know with confidence, just as Samuel did, that the Lord has brought us this far- he will not abandon us. Please join us to bring little sweet Abenezer home! 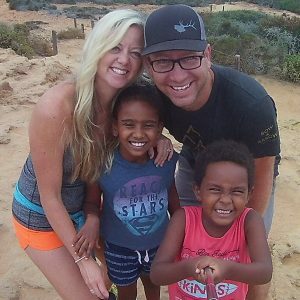 We have been blessed by adoption, and we are in the process of adopting a third child from Ethiopia. The purpose of this site is to share that journey with you as we keep you updated with our progress, prayer requests, and needs. Thank you for your interest, participation, & support. Approval from Citizenship and Immigration Services! REJOICE in the Lord- always? Finally… Progress: Dossier Has Been Sent!